Phoenix Rising was founded in 2004 by Cort Johnson, a person with ME/CFS who wanted to develop a coherent understanding of this illness. 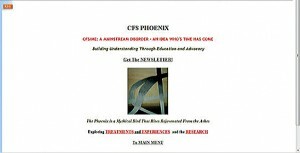 Phoenix Rising came, over time, to include hundreds of articles on treatment, resource, advocacy, history and other areas. 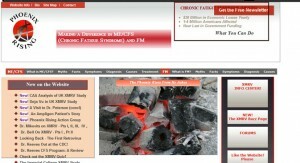 First created on a Frontpage template, Phoenix Rising was ‘CFS Phoenix’ (on http://phoenix-cfs.org url) from 2004 to 2009. 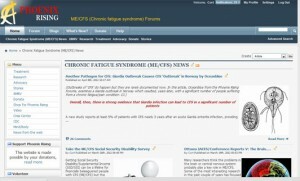 A monthly newsletter begun in 2005, containing extensive reviews of research and treatment studies and events, helped to fill a void in a CFS community eager for information. Phoenix Rising expanded as it added Resource, Story and Advocacy sections to the original Treatment and Research sections. Phoenix Rising remained a stand alone information resource until 2010 when Adin Burroughs created a WordPress blog, giving Phoenix Rising interactive capabilities for the first time. Shortly afterwards, another ME/CFS patient, Gino, proposed that Phoenix Rising host a VBulletin Forum, which quickly grew to be the most visited CFS Forum on the internet. The old website was effective as the addition of the XMRV Buzz page and full coverage of XMRV research boosted Phoenix Rising’s presence on the web. In August 2010 Phoenix Rising became a certified 501 (c) 3 non-profit. In 2011 an upgrade to the Forums allowed for the production of a front page section where articles could be placed in an accessible format. 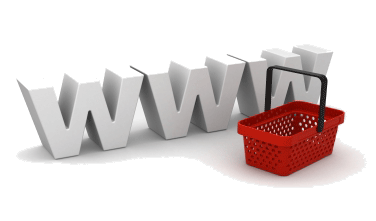 Now, where there had been one website there were three: an aspx site containing hundreds of articles, a WordPress site containing hundreds of blogs, and the large Forums site containing several hundred thousand posts. The next task was to integrate the three sites. In early 2012 the arduous task of moving hundreds of articles from the original website over to the WordPress site began. In April, Phoenix Rising will move to a new Forum package (Xenforo, which we believe provides more long-term opportunities for us) and begin a redesign of the WordPress site. When those two goals are accomplished, Phoenix Rising will have a foundation which should allow us to quickly bring new programs to the ME/CFS community. As Phoenix Rising has evolved so has its logo. Phoenix Rising’s first logo was taken from an abstract painting by Cort Johnson’s father, which Cort felt protrayed a man trying to rise to his feet. The logo went through various iterations as we played with colors and form. In 2010 Lynn Bousquet came up with an attractive variation that was used on the first website. Another variation showed up on the Forums site. Yet another logo was used as the favicon for Phoenix Rising. Eventually different logos ended up being placed simultaneously on all three sites. The search for a new logo began. In 2012 Adin found Elizabeth, a college student, who created the elegant logo that will appear on all Phoenix Rising’s pages today. 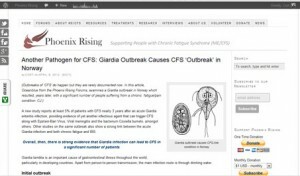 Since becoming a non-profit, Phoenix Rising has worked to build its organizational capacity, to continue to provide the ME/CFS community with accurate, objective, up-to-date information, and to produce internet projects that will help patients find better practitioners, help them choose better treatments, and empower the community.